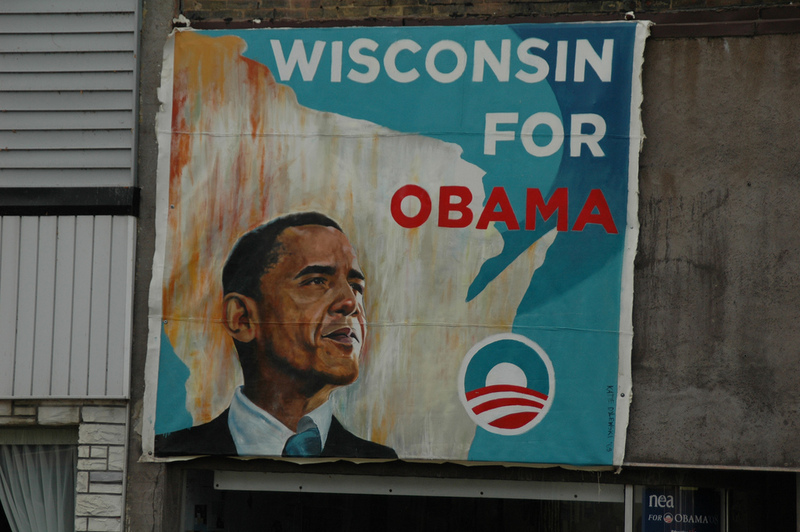 Barack Obama won Wisconsin in 2008 and 2012, but Donald Trump turned the state red for the first time in 32 years. Thirteen counties across the state of Wisconsin have flip-flopped over the last eight years and played a key role in securing Donald Trump’s victory in the state, according to an analysis by the Milwaukee Journal Sentinel’s Craig Gilbert. These counties — Racine, Adams, Winnebago, Door, Pepin, Buffalo, Grant, Jackson, Dunn, Sawyer, Price, Lincoln and Forest — voted twice for Democrat Barack Obama in 2008 and 2012, but voted for Republican Donald Trump in 2016, Gilbert found. These counties voted for Republican Sen. Ron Johnson in 2016, yet voted for Democratic Sen. Tammy Baldwin in 2012. The counties have voted for Republican Gov. Scott Walker three times (2010, 2012 recall and 2014), according to Gilbert’s analysis. Why did these 13 counties, located all over the state, vote similarly, and why have they voted for both parties in different election years? The counties have predominately similar socioeconomic structures, with Gilbert’s analysis showing that most of the counties are overwhelmingly white and rural. Racine and Winnebago are not rural and four of the counties have fewer whites than the 93 percent and above white populations of the other nine counties. They are Sawyer (78.6 percent), Forest (81.3 percent), Racine (83.9 percent) and Jackson (88.4 percent), according to 2015 Census estimates. The median household incomes in these counties in 2015, based on a five-year average, also were all below the state median of $53,357, except for Racine, which was $55,584. Eleanor Neff Powell, assistant professor in political science at the University of Wisconsin-Madison, whose research examines the complexities of representation in Congress, said one explanation for this back-and-forth voting phenomenon in the 13 Wisconsin counties is different people voting, not necessarily people voting differently. Another reason, Neff Powell explained, is that some people may favor a split government and deliberately choose to balance the ticket. While it’s still too early to fully explain the counties’ flip-flops in 2016, Neff Powell said it seems voters’ education level played a large role in people’s decisions at the polls, rather than socioeconomic factors or geography. Byron Shafer, a professor of political science at UW-Madison whose interests include examining the “big picture” in American politics, offers a different view. He said Republicans have constructed a party throughout Wisconsin, while the state Democratic Party has focused its resources into just two counties — left-leaning hotspots Dane County and Milwaukee County. “Republicans in Wisconsin have built a real party,” Shafer said. “Democrats have written off all but two counties. They ought to lose any place that isn’t like Madison or Milwaukee … Republicans would like to get your vote anywhere, Democrats aren’t interested in it except in two places. Republicans’ willingness to broaden the base within the state has paid off recently, with the re-election of Johnson this year and Walker in 2014 and the state swinging red in a presidential race for the first time since 1984. Naturally, Shafer sees this as a significant problem for Democrats in Wisconsin. The media misses the mark, Shafer said, in failing to understand Wisconsin as a place that has embraced both the social welfare reforms of the New Deal and the anti-communist Red Scare of the 1950s fueled by Wisconsin Sen. Joseph McCarthy. These forces are at work in the rural counties, which are not terribly well-off and characterized by traditional values, that have bounced from party to party in the last decade. Shafer said the Democrats could have these counties back, but he believes they choose not to because it would cost them too much in terms of policy. Lew Friedland, a UW-Madison School of Journalism and Mass Communication professor, said the changing communication environment, formally known as “communication ecology,” can perhaps explain the voting patterns of the counties. Friedland studies how communication affects civic and political life. The rise of talk radio in Wisconsin, Friedland said, among the likes of conservative hosts Charlie Sykes and Mark Belling out of Milwaukee, is an example of this. Increasingly, people rely on talk radio as a source of news, Friedland said, and combined with the declining rate of newspaper subscriptions and readers, a more conservative Wisconsin has been formed. Friedland used the case of the Milwaukee Journal Sentinel, which he described as slightly liberal but provides factual, diligent coverage of state government. The paper saw its circulation decrease by nearly 100,000 readers from 2000 to 2010, Friedland said. Friedland said Twitter gives both parties a means of building up internal communication networks and the ability to connect those newly formed networks, further polarizing the parties.